Jennie Hyland was genuinely surprised when she discovered she could earn money while being creative and turning practical everyday items into fun gifts. As a full time working mother, Jennie was keen to find a way to relax but at the same time be creative and so she was greatly encouraged to start her own business. We catch up with Jennie to talk hampers, brand ethos and her special message for other parents out there…. 1. What’s the inspiration behind your business? What motivated you to start one? The motivation to start my business came about when I was looking for ways to have a creative outlet. I’d grown up sewing, drawing, doing embroidery and being creative but never found the magic to earn my living from doing what I love. I work in an administrative role full time during the week and was looking for a way to relax and be creative. 2. What is your brand philosophy/ethos? Practical, made with love, unique and has a wow factor is how we describe what we do. Only quality products are used and we love being part of welcoming a new baby into a family. Everything used in our creations is reusable once the gift is undone. We are unique and certainly a talking point amongst parents and parents to be! Our best sellers would be our individual washagami items made from facewashers and singlets. We have a range of animals, flowers and cars and we sell them individually in a presentation box. 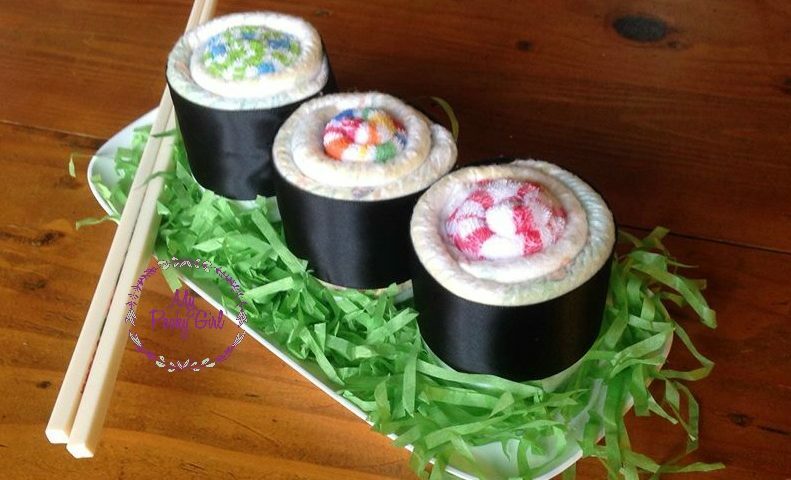 Our nappy sushi is also a best seller and we love the reactions we get from this product. This is presented as takeaway sushi. They are our best sellers as they are an inexpensive fun gift to add into a hamper or to give singularly to a friend, work colleague, neighbour, or a teacher. 4. What is your vision for your business? Our vision is to continue to create original gifts using only the best quality products at an affordable price. We hope to increase our online sales as we are specialise in custom orders and and love offering unique gifts to all of our customers. 5. What is the one positive message you’d like to give other parents out there? Trust your instincts even if you don’t think you have them! Find a reference point that you trust whether its a friend, family member, book or website and use that as your guide. No matter what you see looking at other families, they have all been through what you are experiencing at some stage. Enjoy every moment. Check out Jennie’s Facebook page My Pooky Girl to learn more about her business!